Who doesn’t love the Toy Story movies, right? Everyone from little kids to old folks and a lot of the people inbetween. They’re heartwarming and funny, the voices are outstanding, and the animation fabulous. They tug at the heartstrings – yes, I admit to shedding a tear or two at the saddest (and sometimes happiest) parts of the stories. I choke up when talking to the kids about Andy giving his toys to Bonnie, watching Jessie singing about her girl, or watching Lotso, the Clown and Big Baby being left behind. They send a great message, and you’d never discourage your kids from watching them. Or so it seems at first. The problem arises when your children listen, observe and RETAIN the messages. Until the advent of Toy Story 3, I could, with a clear conscience and no interference (well, OK, I waited until the children were out of the house) sort out the year’s toys. If my children no longer played with them, I could pass on the ones in good condition, either to our local daycare or to friends’ younger children. Those that were broken or missing parts, I chucked in the bin. And yes, the bins were always very full that week. Then along came Toy Story 3. Jessie the Cowgirl is traumatised about going into a box in the attic. Lotso the tyrant runs things at the local daycare and is evil to the new toys. The toys are horrified at the thought of their boy no longer loving them. There is much sadness. Now at my house, there are the cries of “You can’t put the old toys into a box” “We can’t give them to the daycare – what if they are played with badly?” or “What if there’s a toy like Lotso?”. No matter how much reasoning I do, no matter how many times I tell them that toys do not come alive when we’re not looking, no matter much reassurance I give that the children at daycare will love and care for the toys, the small boys will not believe me. So as a result, here’s the state of my lounge. 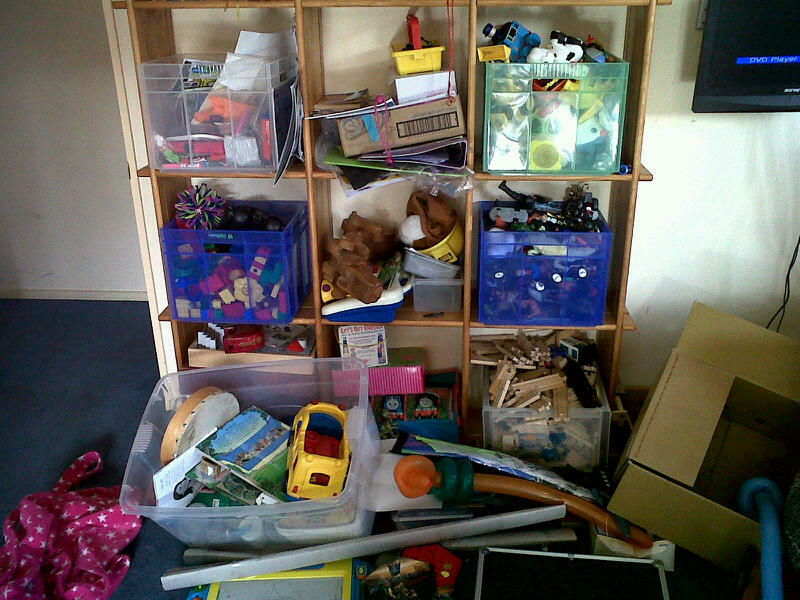 This is just the lounge – I daren’t post a shot of the boys’ bedroom! So damn you Pixar, damn you John Lasseter and Andy Stanton and damn you all the fine actors who made those 3D characters so real. Most of all damn you all for making me feel just a little bit guilty about those boxes of toys in the garage, and the fact that I often try and catch the toys moving around out of the corner of my eye. What movies have influenced the way you live at home and why? I love this! Toy Story has had the same effect on me. Here I am at 26, sorting through all of my old childhood things that my mom managed to save until I moved in with my husband and I begin to feel guilty. My poor toys! They must feel so forsaken! I have even started to feel bad about giving plush toys to my dogs, knowing that they will tear them up. I agree, damn you Toy Story! Thanks for stopping by and becoming a subscriber. New post coming soon! You’re welcome! I look forward to reading more!